We'll show you how much welding time to expect from the most popular cylinder sizes used by hobbyists. Once you have a handle on the welding time a cylinder provides, you can then compare cylinder physical dimensions to be sure it will fit in your vehicle or welding cart. You’re only a quick read away from knowing what size welding gas cylinder to choose. 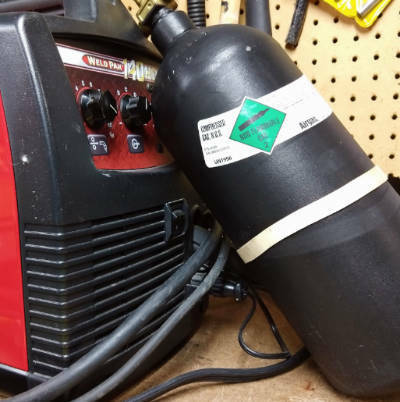 You’ll find them smaller and larger, but most homeowner and hobby welders choose gas cylinders with volumes of 20, 40, 80 or 125 cf (cubic feet). The larger of these cylinders provide plenty of welding time while still remaining portable and easy to transport. Keep in mind that specifications may vary among cylinder manufacturers. And because you may see high-pressure bottles labeled by a letter or content weight, I’ve included commonly used alternatives. While much larger cylinders are available, those are often leased bottles delivered to high-volume customers by the gas supplier. The larger the cylinder, the more economical the refills. You won't pay much more to get twice the gas. My last purchase of an 80cf cylinder totaled $227 before tax. This broke down to $170 for the bottle and $57 for 75% Argon/25% CO2 (C25) MIG gas. The local supplier was 20 miles away from my home, and the round trip took about an hour and a half of my time. At the time, I thought it was only possible to buy empty welding cylinders online. I’ve since learned that I can have a full 80cf cylinder delivered to my door at a similar price. These bottles get good, legitimate reviews that receive an “A” rating from Fakespot. Any decent gas supplier shouldn’t have a problem refilling a good quality cylinder, but you’ll want to check your local options. You might be fortunate to find a small, but helpful, gas supplier like the one in this video. See the cylinders popular with hobbyists, along with what to look for when buying used gas cylinders. How long will MIG gas last? How much welding time you’ll get per bottle will depend on the flow rate you’ll set on your regulator—usually in the range of 10 to 40 cfh depending on the work environment. You’ll need a higher flow rate to maintain shielding gas protection in a windy area. Even with my garage door open 12 inches or so, I get good results with a regulator setting of 20 cfh as long as it’s calm. So, using my 80cf cylinder, regulated at 20 cfh: (80 cf) / (20 cfh) = 4.0 hours of welding time. Of course, these are calculated times and your real-life welding results will vary. Significant temperature swings and the frequency of start and stops—especially with machines having pre/post-flow settings—will affect your run time. It’s a good practice to check your regulator occasionally as you weld. As the gas is used up, cylinder pressure drops changing the flow rate from single stage regulators. Again, temperature changes have the same effect, so don’t be surprised if you’re adjusting the regulator more often than you expected. I’ve picked up the habit of backing out the gas regulator adjustment to “0” when I finish a welding session. Recommended by manufacturers to remove spring pressure from the valve diaphragm, this practice also forces me to adjust gas flow the next time I weld. How much gas is left in the cylinder? On a full welding gas cylinder at 70 degrees, the pressure gauge should read near the cylinder's working pressure. Barring a drastic temperature change, or a leak, you can expect the pressure to respond linearly to the remaining gas volume. So, if your full cylinder started with 2000 psi on the pressure gauge, a reading of 1000 psi tells you that roughly 50% of your gas remains. Of course, some pressure gauges are more accurate than others, especially in the lower range. But as long as the regulator is maintaining the set flow—while the trigger is pulled—you can keep on welding, knowing that your weld is protected. And don’t be surprised if you notice the gauge seems to hold steady for a time, then drops suddenly. The slow gas discharge rate that we use in welding can cause the pressure dial to temporarily hang-up. 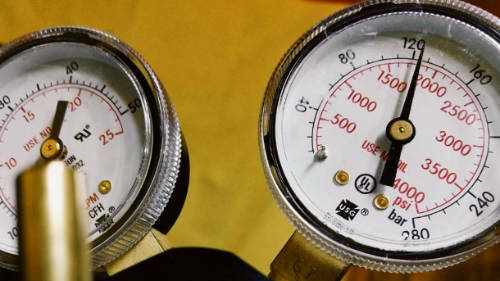 It won’t take long before you get a feel for the accuracy of your pressure gauge. See why MIG is the Best Welder for Beginners. How much MIG wire will I use? If you’re at all like me, now that you know how long the MIG gas will last, you’d like to know how much wire you’ll use per cylinder. Here’s how to get that with a deposition rate (lbs/hr) formula. 13.1 = is a constant that is based upon the density of steel and its cross-sectional area. If the melt-off rate is all that is required, then use the same formula and remove the factor for EE. I found this formula in the free guide Gas Metal Arc Welding | Product and Procedure Selection by Lincoln Electric. Because we’re interested in how much wire we’ll use—not how much makes it into the weld—we don’t need to use an efficiency factor. 13.1 x (0.030)² x (250) = 2.95 pounds of wire per hour. From a our first table, I know that my 80cf cylinder should provide 4 hours of welding when regulated to 20cfh. This means I should expect to use around 12 lbs. of 0.030” wire when welding at 250 ipm. We can reduce the constant and wire size in this formula to a simple factor providing MIG wire use per hour with different wire sizes and wire feed speeds. 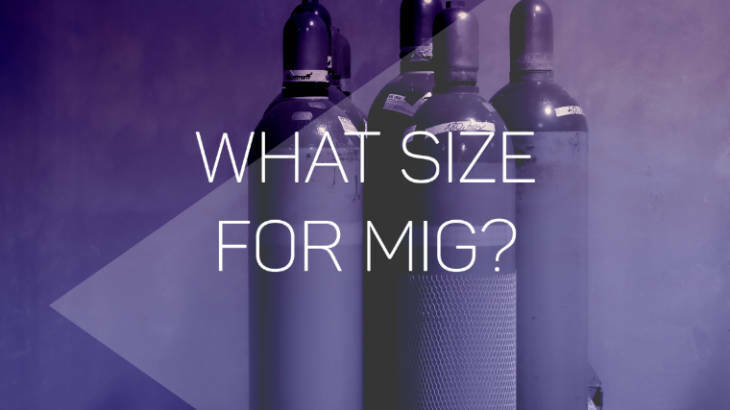 You've seen how long MIG gas will last, and how much welding time you can expect from bottle. I hope you now have a good idea what size welding gas cylinder is right for you—so you can start MIG welding soon! But if you still have questions, leave a comment below and we'll get it answered for you.